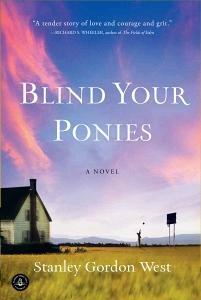 If Hoosiers and Breaking Away are among your favorite movies and if you cheer for the underdog in the NCAA tournament, Blind Your Ponies is for you. Between 2001 and 2010, Stanley Gordon West hand sold over 40,000 copies of this formerly self-published 539-page novel out of the trunk of his car. Last year Chuck Adams, the editor of Water for Elephants, read it and grabbed the novel for Algonquin Books and it’s been flying off bookstore shelves all across America. Reading this story is the closest thing to the Indiana high school basketball games I grew up seeing when entire towns shut down for tournament games. This tale, however, is set in the tiny town of Willow Creek, Montana where the boy’s basketball team hasn’t won a game in five years. Sam Pickett, the coach, has quit and his escape to this small town isn’t working out as he’d expected. When Peter, a true point guard, moves in with his irascible grandmother during his parents’ divorce and Olaf, a 6’11” Norwegian exchange student arrives, things begin to change. Sam returns to coach and lead these boys in a quest that he reminds them resembles that of Don Quixote. The team begins winning and the entire community begins to believe that they could just possibly win the state tournament. Once the townspeople begin believing in the team they also start believing in themselves. This is the book to put in the hands of reluctant readers particularly teenage or young adult males that love basketball but think they don’t love reading. They’ll thrill at the detailed descriptions of passes, pick and rolls, and screens. Non-basketball fans may find the games too technical but they’ll still enjoy the redemptive story. I imagine that it’d be almost impossible for an editor to tell a 78-year-old author who’s sold thousands of books without any help that the novel would be better if he’d tone down his overly florid descriptions and eliminate some of the contrived metaphors. But that’s just quibbling. The writing isn’t perfect and the book could be more concise but this guy isn’t Hemingway, he’s an old-fashioned storyteller. The humor is contagious and the characters seem like family in a book that will get story lovers through a long cold winter. Summing it up: This old-fashioned yarn will appeal to basketball fans and those who love triumphant stories with quirky characters. Three sisters, recalling the three witches in Macbeth, have returned to their small college hometown after learning that their absent-minded but brilliant mother has breast cancer. Their mother’s illness provides them with reasons to avoid uncomfortable truths awaiting them in the world outside fictional Barnwell, Ohio. The novel’s first sentences tell the tale: “We came home because we were failures. We wouldn’t admit that, of course, not at first, not to ourselves, and certainly not to anyone else. 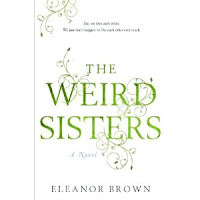 We said we came home because our mother was ill, because we needed a break, a momentary pause before setting off for the Next Big Thing.” The novel's unusual first-person plural narrative voice establishes a distinct tone that allows the sisters to speak as a modern-day Greek chorus and gives the reader an immediate sense of belonging to the family. Rose (Rosalind), the eldest, is a math professor at a large university in nearby Columbus who coordinates everyone else's well being while spurning her fiancé’s request to join him in England. Bean (Bianca), the dazzling but insecure middle sister, has been fired from her job in New York. Finally, the baby, Cordy (Cordelia), arrives malnourished and unwilling to admit that she’s pregnant. Their father, a professor, is so obsessed with Shakespeare that he speaks almost entirely in the words of the bard. This is a family that insults, banters, and communicates in sonnets and couplets. 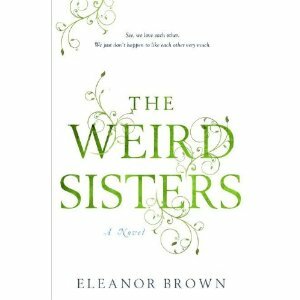 This device shouldn’t work; it should be tiring and overwrought, but Eleanor Brown seamlessly fashions it into an effortless view of the sisters as a family. To read or not to read, that is the question. I highly recommend this novel for those who love books. It’s a love letter to the power of reading. It’s also a perceptive look at families and the values and characteristics that seemingly different members share. Even the minor characters are original and filled with wisdom. Father Aiden tells Bean, “We tell ourselves we are too fat, or too ugly, or too old, or too foolish. We tell ourselves these stories because they allow us to excuse our actions, and they allow us to pass off the responsibility for things we have done, maybe to something within our control, but anything other than the decisions we have made.” This novel introduces a bevy of intriguing characters whose stories illuminate our own foibles while granting readers a charming interlude and much to consider. Summing it Up: Don’t miss this ode to the power of books, families, and to the joy in stepping from safety into real life. Select it for your book club and you'll have a discussion that leads itself.